Members of the Greater Oswego-Fulton Chamber of Commerce Golf Committee are busy finalizing the details for one of the Chamber's most popular events, the Annual Golf Spectacular. 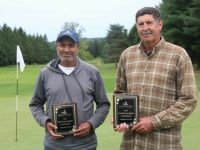 Scheduled for Monday, June 16th the 2014 Greater Oswego-Fulton Chamber of Commerce Golf Spectacular will feature a four-person captain and crew format and tee off at 10:00 a.m. at Beaver Meadows Golf Club, 185 Barnard Drive in Phoenix. Last year more than 100 members hit the links to enjoy a full day of fun and golf with their fellow members. The 2014 Chamber Golf Spectacular features chipping and putting contests; prizes for longest drive, straightest drive, and closest to the pin; a skins game; and two hole-in-one contests: one for a chance at $10,000 courtesy of the John FitzGibbons Agency, and one for a chance to win a new automobile courtesy of Burritt Motors in Oswego. New to this year's event is the $1,000,000 Hole-In-One contest! "Over the years the Chamber Golf Spectacular has offered participants the opportunity to win some great prizes, said Golf Committee Member, Brooks Wright of KBM Management. "But nothing comes close to this, a chance to win $1,000,000. Thanks to John Zanewych of Big John Sales and NTI Boilers, who are sponsoring the $1,000,000 Hole-In-One contest, excitement for this year's Golf Spectacular is at a whole new level." The chamber is currently accepting registrations for members wishing to play in the 2014 Chamber Golf Spectacular. An entry fee of $450 per team of four golfers includes green fees, cart, lunch, and a full steak dinner following the event. Registration is limited and team spots will be filled on a first come, first served basis. All registrations must be received no later than June 2.